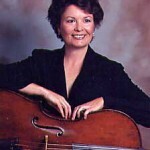 Sharon Prater has been seen on many of the major concert stages of the world as former cellist of the internationally acclaimed Colorado Quartet. The group’s busy schedule at that time included performances across North and South America, Asia and annual tours of Europe. Ms. Prater is a graduate of the Juilliard School, where she earned the Master of Music degree and for two years worked as teaching assistant to Joel Krosnick of the Juilliard Quartet. Other studies were at the Aspen Music Festival with Paul Katz and the Cleveland Quartet, the Banff Institute with Zoltan Szekely and William Pleeth, and the Britten Pears School (England) with the Janacek and Vermeer Quartets. Coming to Toronto in 1990, Sharon was subsequently a member of the Canadian Opera Company Orchestra, the Amadeus Ensemble, and the Espirit Orchestra. She has been on the faculty of the New School of Music (Philadelphia) and taught as adjunct chamber music faculty at the University of Toronto, as well as being a guest lecturer and performer at universities and festivals across Canada and the United States. A member of Ensemble Vivant between 1999 and 2009, she recorded four discs with that group – “The Music of Leroy Anderson”, “Fete Francaise”, “Audience Favouites”, and “Homage to Astor Piazzola”. Sharon was Principal Cello of the Toronto Philharmonia from 2003 through 2012. She plays on a cello by Jose Contreras made in 1762.